The Greatmats 4×6 Ft x 3/4 Inch Straight Edge Standard Sundance horse stall product is the straight edge version of our very popular Interlocking Sundance Stall Mat. These incredibly durable and affordable 4×6 rubber stall mats work perfectly in horse stalls, weight rooms, and Cross Fit gyms, or wherever the smell of rubber is not a concern indoors. The 4 ft. x 6 ft. x 3/4 in. Straight Edge Standard Sundance Tile features a pebble like top surface for added traction to your floor. The stall mat weight of 100 pounds per tile means these tiles are not designed to be portable, but they’ll work great as a permanent type of surface installation in a horse stall. Here are some of the key features of our Straight Edge Standard Sundance thick rubber stall mat tiles. Materials: The primary material used in making these tiles is recycled rubber. Water resistance: Water or other liquids will not penetrate these horse stall mats. No-slip surface: Each tile offers a slightly rough, pebble like surface that prevents slippage. The surface is called a punter surface. Designed to Stay Put: The stall mat weight per tile measures about 100 pounds each, meaning the tiles are not easily portable. And the 3/4 inch thickness of these 4×6 stall mats means they cannot be rolled up easily for carrying. Easy installation: As long as you have a flat surface over which to lay the mats, you can install them relatively easily. Place the rubber mats over the top of concrete, dirt or gravel. Because the horse stall mat weight is 100 pounds per tile, at least two people should work together on installation. Cutting: Even though these 4 ft. x 6 ft. x 3/4 in. thick rubber stall mat tiles are heavy and have a sturdy construction, you can cut them to fit around the edges of the stall with a sharp utility knife and a straight edge. You then can bend the mat across a 2×4 and snap it before cutting the other side, just like a piece of drywall. Another option is to cut the rubber mat with a jigsaw or with an electric circular handsaw, but you’ll want some help to complete this process safely. Using a saw will also cause the blade to dull. Although the traditional surface for a horse stall is firmly packed dirt, sprinkled with hay or straw as bedding, thick rubber mats, such as our Straight Edge Sundance mats, have quite a few advantages over using dirt in the horse stalls. Lower costs: With heavy rubber mats installed, you’ll use less hay and bedding in the stalls. The horse won’t grind the bedding into the dirt, meaning less is needed. No More Muddy Floor: A dirt floor will soak up water and urine, eventually turning into a muddy mess. Our Sundance mats do not soak up water, meaning the floor of the stall remains easy to clean. Additionally, the sturdy rubber stall mat weight means it resists curling or buckling, so water cannot seep underneath. No More Rutted Floor: Horses may cause ruts in a dirt floor, leaving it uneven for walking and unsafe. The horse stall mat weight allows it to remain in place, providing a smooth surface for the horse and for the owner. Mucking: Cleaning up after the horse becomes much easier with thick rubber mats installed. With mats, you don’t have to deal with muddy or uneven ground inside the stall that makes shoveling and sweeping difficult. You also won’t lose your gravel or other fill during the mucking process. Cushioning: Although our rubber horse mats are sturdy and provide a hard surface, they do have a little bit of give to them. This means they’re softer on the horse’s joints than concrete or hard-packed dirt or gravel. These rubber mats provide shock absorption and anti-fatigue benefits for large animals. Warming layer: Having a layer of stall mat weight in the tiles provides a bit of insulation for the horse versus standing and laying on a cold dirt floor. A heavy horse stall mat weight works especially well for a horse with joint or arthritis problems. Each horse stall mat can support the weight of the horse as it moves around, as long as you select a high quality of mat. Some key features to consider include the following. Thickness: Our 4 ft. x 6 ft. x 3/4 in. Straight Edge Sundance mat tiles provide a desirable thickness level. The 3/4 of an inch of thickness supports the weight of the horse extremely well, although thicker pads are available (usually up to 2 inches in thickness). However, installing mats thicker than 3/4 of an inch can be difficult because of the added weight they have. A 4×6 rubber mat that’s 2 inches thick will weigh more than 250 pounds. Straight edges: It’s extremely important to have mats that either lock together or that have straight edges that tightly fit together. Should gaps develop between the tiles, you may find water and urine leaking into the gaps and muddying the ground beneath. This may compromise the ground beneath the mats. Interlocking mats: Although our 4 ft. x 6 ft. x 3/4 in. Straight Edge Sundance mats do not interlock at the edges, Greatmats does offer interlocking mats. An interlocking mat option represents a smarter idea for your horse stall mat choices if your horse likes to dig or paw at things in its stall. The seams of interlocking mats fit together tighter than straight edge mats, preventing damage from pawing. Weight: Even though thicker and larger stall mat weight makes the tiles more difficult to install, heavier mats are more desirable. Heavier mats have less of a chance of slipping out of place or buckling under the weight of the horse moving around. Because of the weight of these rubber tiles, you’ll definitely want some help with the installation process. Construction quality: Selecting a horse stall mat weight of a high quality, such as our Greatmats Sundance 4 ft. x 6 ft. x 3/4 in. mats, is a must, which ensures the mat won’t shift around or curl at the edges. Lesser quality rubber mats may include non-uniform thickness or a thickness level that’s less than stated in the specifications, both of which could causes a failure of the mat through buckling. Cheaper mats won’t have perfectly straight edges either, meaning they won’t fit together. Should you need a different size or thickness of horse stall mats than our 4×6 rubber stall mats, Greatmats carries several options. Just contact our helpful customer service center or look through the links on our site to see what’s available. Before ordering the thick rubber stall mat tiles, you will want to closely measure the area of the stall. Mats should go to the edges of the stall, just to ensure that there’s no chance of tripping over the edges for you or the horse. Figure out how many square feet you need. The standard size of one mat measures 48 inches wide by 72 inches in length, resulting in 24 square feet per tile. Here are the number of tiles you’ll need for some standard horse stall layouts. Before your 4 ft. x 6 ft. x 3/4 in. tiles from Greatmats arrive, you’ll want to prepare the stall area. Clean up the area, removing any manure, stray bedding and straw. Make sure the area is level. The area doesn’t have to be perfectly level to the point that you use a bubble level to measure it, but it should be flat enough that the thick rubber stall mat tiles will lay flat. Although you may install the 4×6 stall mats directly over a dirt floor, you may want to lay down a bed of a couple of inches of pea gravel. This provides a good base to ensure a flat area over which to place the rubber mat tiles. Beyond using the Straight Edge Sundance tile mats inside a horse stall, you could use them for an installation in a weight room. The thick mats will protect the floor underneath from any dropping of heavy free weights on the floor. Additionally, these rubber tiles will stand up to heavy exercise equipment without suffering damage. However, these tiles do yield a rubbery smell, greater than that of other types of Greatmats flooring options. If you choose to use these thick rubber stall mat tiles indoors, you may experience some odor, especially in a room with little ventilation. When Fun Creator and Entertainer Andy Hill decided to open Jacks Ultra Sports in Conway, Arkansas, he knew that he needed to make the front entrance, party rooms and check-in areas of his 28,000 square foot warehouse fun and safe. And a big part of that process was converting the polished concrete floors into surfaces that would both look nice without being slippery. While searching Google for just the right surface, the 28-year-old discovered Greatmats.com and found not only the product he wanted, but the best price and best customer feedback. Hill decided on 1/4 inch thick Rubber Flooring Rolls with 10 percent confetti color. He was also able to save money by installing the flooring himself. ”You have to have some knowledge and experience with making the cuts and applying glue, but overall, it was fairly easy,” Hill said. That’s how the idea for Jack’s Ultra Sports was born. Conveniently located off I-40 in Conway, Jacks offers 2 paintball playing fields for low impact only. Jack’s, also has plans to open state-of-the-art ULTRA-3D laser tag this fall. When Dunamis Therapy and Fitness to opened its fourth facility in Augusta, Wisconsin, in December of 2014, the unique 24/7 fitness center with a connected outpatient physical therapy clinic wanted to make sure it had all its bases covered. With concrete flooring throughout the building, sound travel was an area of concern – especially in the free weight area where the noise of clanging steel can aggravate even the most seasoned fitness veterans. To solve this problem, Dunamis Therapy and Fitness opted to install 3/8 inch thick Greatmats rubber flooring rolls in its 24 x 25 foot free weight area. Trina pointed out that Greatmats’ rubber matting also protects the concrete floors from dropped weights. An added benefit of the rubber floor covering is its ease of cleaning, especially during the vacuuming process. Mopping can be a little more difficult due to its non-slip surface. Dunamis Therapy and Fitness, founded in 2003, has three other locations in western Wisconsin, including Chetek, Thorp and Eau Claire, and an Altoona facility is in the works. Greatmats rubber flooring was also installed in the Thorp facility around the same time as the Augusta center and has had the same result. ‘It doesn’t move, and it’s comfortable,’ Trina said. Backed by a ten year warranty, we offer one of the best life-cycle flooring values anywhere: The Burke Commercial Rubber Endura Flecksibles collection provides durability, comfort, and slip-resistance while creating an impressive look. This product is being used worldwide in thousands of commercial, institutional, and industrial facilities because of its rugged toughness combined with remarkable comfort and good looks. This commercial rubber flooring product meets guidelines established by ADA for walking surfaces and ramps so you can use it in any number of commercial facilities. Great for walkways, corridors, basement floors, or any other industrial application. This commercial rubber flooring product is also certified to meet the requirements of The Flooring Products Certification Program for Indoor Quality. Add stair treads and risers for a complete commercial rubber flooring system. 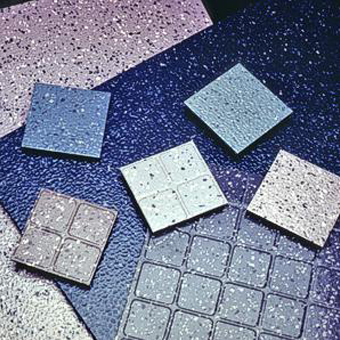 The Commercial Rubber Flecksibles collection is comprised of 15 standard multi-color patterns. Each Commercial Rubber Flooring Tile Flecksibles color-way consists of a standard Uni-Color base color with Uni-Color chips mixed in to create a dynamic, non-directional design. This makes it easy to use solid Uni-Color tile with multi-color Commercial Rubber Flecksibles to create your own unique borders, patterns, and designs. Custom colors may be special ordered. Custom Colors Require a 1000 SF minimum Order. Commercial Rubber Flecksibles Tiles are available by the carton and samples are available upon request. Matching stair treads are also available. Not sure how much to order for your commercial rubber flooring? Check out our floor plan designer/estimator on our site. We Recommend Using BR-711 for an adhesive on this product. Made in the USA of recycled rubber content. Waterproof and Odor-free. This product is freight delivered.